For its first entry in the Le Mans 24-Hour race on 23rd-24th June 1951, Porsche had two 356-2 Gmûnd coupés with aluminium body on the starting grid. In their first attempt, Auguste Veuillet and Edmond Mouche won in the class up to 1100 cc. This was also the first victory for a German sports car in international racing after the war. The car was propelled by an air cooled four cylinder boxer engine of 1.083 cc producing 46 hp. The Porsche 356-2 Gmünd for Le Mans 1951 weighted 640 kg. Performance-enhanced beetle engine for the Porsche 356 had an output of 40 hp/29 kW at 4.200 rpm and developed its maximum torque of 70 Nm at 2.800 rpm. The Volkswagen with a 1,1 litre engine only produced 25 hp/18 kW at 3.300 rpm and 68 Nm at 2.000 rpm. Indeed, in order to meet the requirements of the 1100 cc racing class, the Porsche displacement was reduced in comparison to the Volkswagen from 1131 cc to 1086 cc. this was achieved by reducing the bore from 75 to 73,5 mm. The stroke was left at 64 mm. Both Volkswagen and Porsche had a two-piece crankcase made of light alloy (Wilmil or electron) and grey cast iron cylinders. 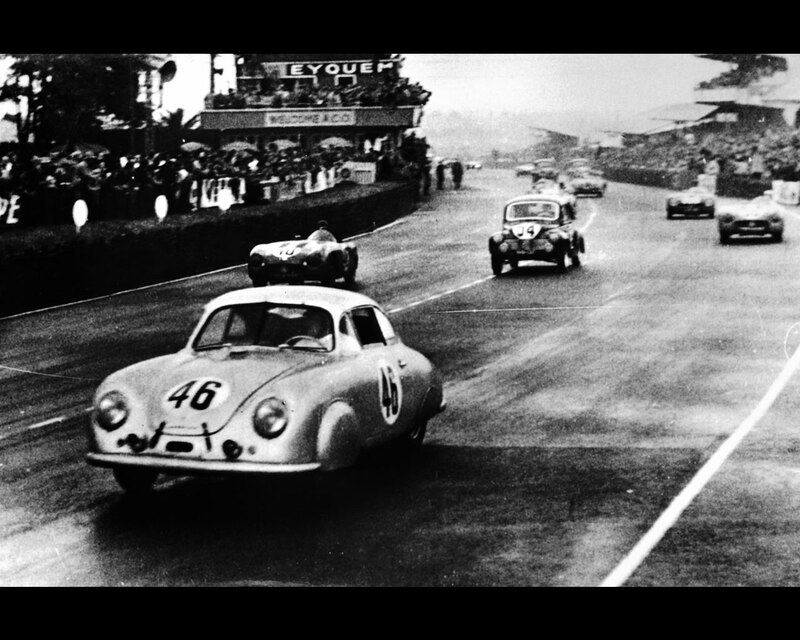 Instead of the Beetle's recessed-head-type piston, the 356 however used a curved dome-type piston, also known as the bosom piston; compression ratio rose from 5,8:1 to 7:1. 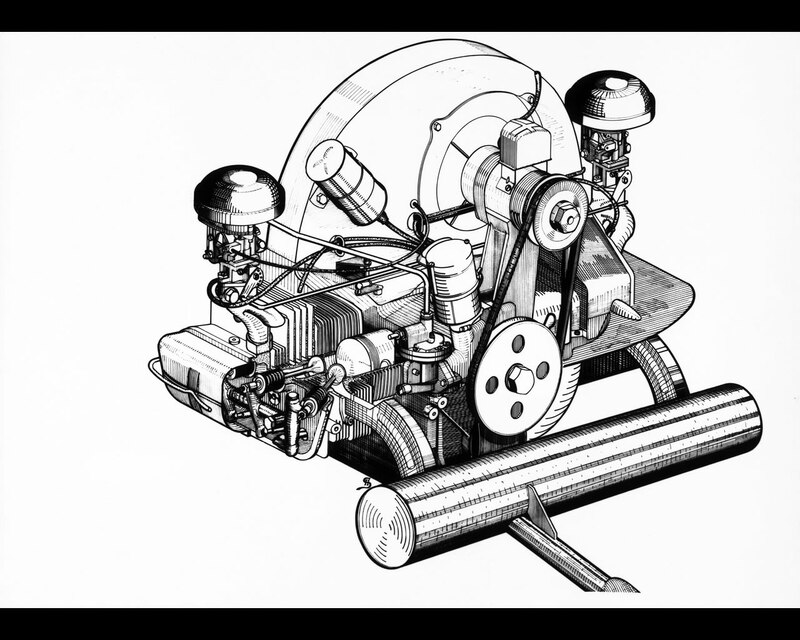 Whereas the Beetle engine had its mixture supplied to it by a Solex single-bore carburetor with a 26 mm passage over an extended intake manifold, the Porsche was aspirated by two Solex 32 PBI downdraught carburetors over short, twin-draught intake manifolds. This task was made easier by means of enlarging the intake valves from 30 to 38 mm. The exhaust valves also exhibited a slight increase in head diameter from 28 to 31 mm; apart from this, in the Porsche they were inclined outwards by 32 degrees so that they formed a V-shape thus resulting in a combustion chamber shape that was wedged in the cross section. These measures led to a complicated, but robustly designed cam follower bridge in the new light-alloy cylinder head design of the Porsche 356. In 1951 Porsche had boosted the output even further to 46 hp for the Le Mans 24 Hour race.